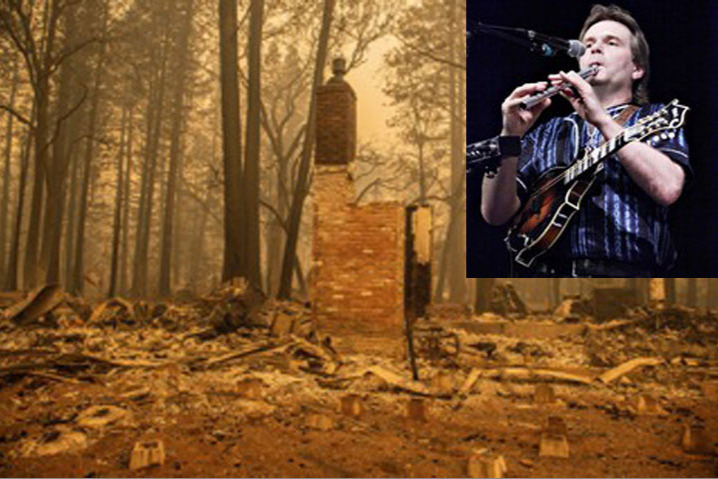 Radim Zenkl, a world-renowned mandolin and flute player, composer, and teacher, lost his home of 15 years in the deadly Paradise, CA Camp Fire. Fortunately for his safety, he was on tour during the massive blaze, but the house is lost, along with many of his musical instruments, some of them custom-built or of European vintage, a collection of ethnic flutes from around the world, recording studio equipment, a large library of music books, CDs, videos, handwritten manuscripts, and more. Basic insurance coverage for the dwelling cannot cover the magnitude of the loss. In addition, much of the area will remain uninhabitable and unsuitable for rebuilding for a considerable time, so relocation costs will be significant. We at Acoustic Disc would like to assist our friend and recording artist in these difficult times. Money cannot adequately compensate for the loss of irreplaceable instruments or of precious time spent, but your donation to this GoFundMe campaign can certainly help Radim rebuild and refocus on sharing his magnificent music gifts with us. You may also lend a hand by hosting a house concert for Radim in your area. For that, please contact Radim directly at europick@zenkl.com. Thank you. With your help, the phoenix will rise again from the ashes!